fidelity emerged in January 2014. Trierweiler learnt of the affair with Julie Gayet through the press – just like everyone else – and the world’s media quickly descended on the salacious details and damaging political implications of the story. The time soon came for Valérie to tell her version of events. First published in France in September 2014, Trierweiler’s memoir promptly became the fastest-selling book in French history, sending shockwaves through the establishment for its scandalous revelations about the President’s politics, personality and private life. 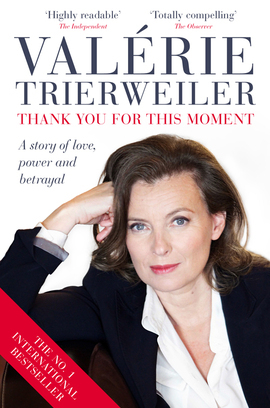 The unapologetic and unadulterated account of Trierweiler’s years with the President, Thank You for This Moment is a tale of love, power and betrayal that has enthralled readers on both sides of the Channel and across the world. An extraordinary kiss-and-tell memoir. Nobody can resist the allure of Valérie Trierweiler. She speaks loud, clear and without caution. Brilliant. It’s an old story, but the way Valerie tells it, with no punches pulled and plenty of torrid moments, it will make a gripping film. I have long thought Britain should follow the US and give an official role and speaking part to the leaders’ wives (or husbands), and this book reinforces this argument.